The Elf played their second consecutive game at Rushall this week in a game where an icon was born. Andy Gorton, one of the very few original 1987 Elves left today surpassed Tim Oliver’s all time run record on a glorious day in the English summer sun. Skipper Hewlitt won the toss and elected to bat on what looked like a road and Hewlitt was not disappointed. Andy Gorton and Ian Chuck absolutely piled on the runs and made the Nomads’ bowlers really work for their wickets. Some revenge for the Elf as they were drubbed by Nomads last June was revenge was certainly a dish better served cold today. Gort only needed 55 to break the record and there was some muted celebrations when he reached his 50 as the spectators knew the icon was only five away from greatness. Gort did so with a rare two on Rushall’s pitch to a rapturous applause from all watching. Thoroughly deserved to a legend of The Elf who now has his name etched in glory. Slightly village circumstances before and Ian Chuck who looked about as likely to get out as I am to marry Kelly Brook, retired once he reached his superb sixth ton for the Elf leaving Rich Fell to leave in disgust. On loan from Rushall Andy Callaghan came in and scored with good time to get some more runs for his second club. Just after Chuck retired he went to umpire and obviously triggered Gort on 64 but who cares? Calla was shortly out with the score on 222 after Nath Martin refused to put one leg in the air and obviously there was a wicket on Nelson. Dave Preece nudged his way to 16 not out and Rob Hewlitt got a single as the Elf finished on 235-2. After tea was devoured the Elf began their defence of the score with Dan Armstrong who couldn’t quite get the line right and Nath Martin who both bowled well in the opening stages but it wasn’t until the Iceman Chris Hall entered the fray in the 10th over got a wicket with his first ball and the Elf were on their way. It wasn’t until the part timers Andy Callaghan and Greg Phillpott came on to bowl did the Elf start to turn the screw. Phillpott picked up Stanley and Calla ran out Westwood after some superb fielding from Dan Armstrong. Spin King Jonathan Preece came on after drinks and bowled Turnbull and the Elf knew they were almost home and dry with the overs rapidly decreasing. Nomad Paul Fearon who bowled well earlier came in and gave the ball a bit of a whack to finish on 46 not out with Tom Davies getting the last wicket for the Elf when he got Hutton caught and bowled with a great reactionary catch. As the sun began the set the Elf were led off the pitch by now iconic Andy Gorton and they have now got their 4th win of the season going into next week against usual opponents Beaumont at Aldridge. Strong tea as usual at Rushall. Sandwiches, pizzas, chicken legs, an array of crisps. No olives, strawberries or mustard so a standard 7/10. Still no Dan Armstrong in the showers despite turning 18 in May but always a good shower at Rushall and definitely better than Aldridge. 8/10. Chally and Nath Martin trudged up the travelator for 16 overs and only one wicket between them this week. Chall also been on the track at Tipton Sports Academy this week trying to burn a few extra calories when he reaches the summit at the end of his run. Every claimed to have not watched a minute apart from Andy Carrick who turned up to support the boys who said it was ‘class’. Dan Armstrong apparently ‘watched 10 minutes and turned it off’. Greg Phillpott only watched because of the ‘high calibre’ of ladies on there. More updates next week. Walsall Health beat Bharat Parivar by 6 wkts. The hottest day of the year so far, saw the first visit of Bharat Parivar CC to Rushall. After heavy rolling duties were carried out, ( to the advantage of the batsmen as usual) and Dan Armstrong and Ian Chuck had finished their 3 hour net, the game began. Tom Davies opened up with the new cherry, only to realise that our opposition had decided to play T20 style, the 2nd ball of the match, crashing into the offside fence for six. It was Dan Armstrong on travelator duty this week, who got the breakthrough, with a low shooter. Tom Davies joined the party from the other end, courtesy of a sharp catch by Rob Hewlitt. With two quick wkts falling, Parivar continued with their high risk tactics. Captain Hewlitt moved Chris Hall to the long off boundary, sensing a big shot was on the way. Next ball, the No4 batsman payed no attention to the field adjustment, smacking a Nathan Martin fizzer straight down Chally’s throat, to the relief of the crowd, who at one point, feared the ball was coming their way. It was good to see Nath back for his 1st game of the season, bowling at a good pace, and unlucky not to pick up a couple more. With Parivar losing their top order, the runs started to dry up, but it was Chris Hall, who suffered more rotten luck from his all time favourite end, the Travelator. A quiet word from Gort, mid over…get one to nip away, and we are in business. This proved wise counsel, as next ball, Chally carried out the plan to perfection. Parivar’s batsman had a wild swing, missed it by miles, and was halfway to Pelsall common, when Gort whipped off the bails. Sadly, the square leg umpire was either grabbing forty winks, watching Shakoor Rana’s best bits on youtube, or simply thought a batsmans crease was the length of Hadrian’s Wall. Needless to say, the bowler was not amused. Despite all this controversy, the Elf continued to turn the screw. 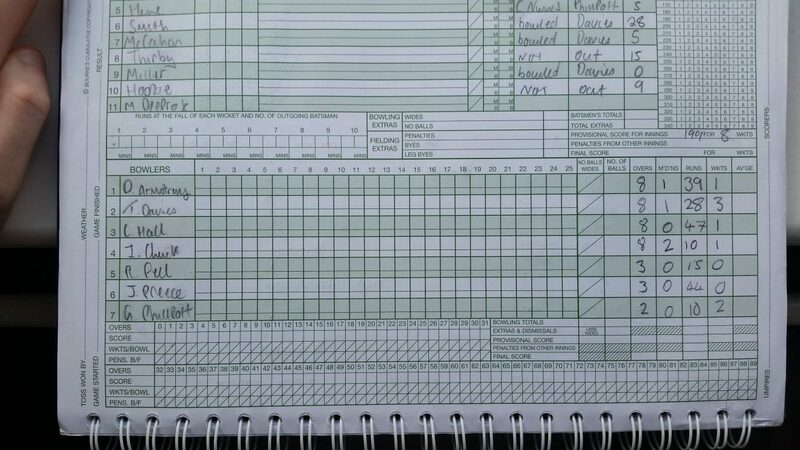 With wkts from the ever reliable Ian Chuck, and JP. 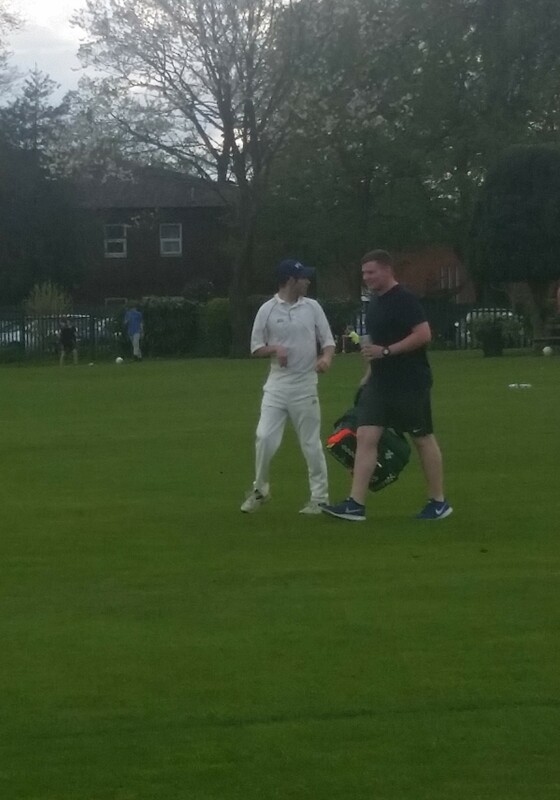 Followed by Dan Armstrong, fresh from a still irate Chally, yelling at him, (Sorry Dan) who came back on, to wrap up the tail, including a batsman who had his potty training interrupted, to be the Jack, of 9,10 Jack. Serious village. Parivar, who early on, looked set for a big score, were reduced to 156 all out. A good effort in the field to peg them back. After tea, the Elf fancied chasing this total down. Things were looking good after a swift start from Ian Chuck. However, on 20, Chuck had a Haley’s Comet moment. Missing a straight one. Following a 10 minute rant to his girlfriend about getting out, he swiftly went out to umpire and trigger Gort, who had been busy ship steadying. With Alex Nunns getting out to a ball that trickled back onto his stumps (unlucky) followed by a bout of batting glove kicking, the result was in the balance at 70-3. However, this side is made of strong stuff, and doesn’t roll over easily. So it was Captain Rob Hewlitt and experienced campaigner Richard Fell, who calmly put together the match winning stand. Steady, no panic, the best partnership of the match, which caused Parivar’s Junior player to run off the pitch and do a fine impersonation of Gazza at Italia 90. Or maybe he just needed his nappy changing again. The final Chapter of the match, saw Nathan Reeves enter the game, after the departure of Richard Fell for 25. Nath doesn’t believe in having a look at the first couple, and simply blasted a quickfire 10 off 5 balls, to the delight of the supporters. 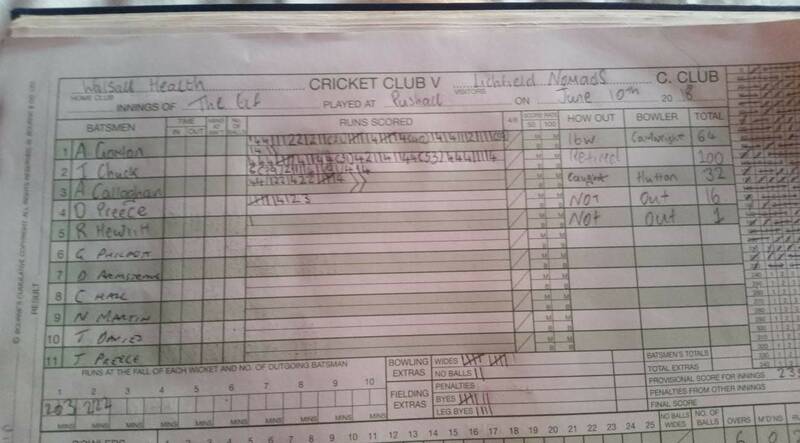 Rob Hewlitt, rock solid at the other end, with a Captain’s knock of 57 not out, knew the job was done. A good win in the end, against a side that were potentially dangerous opponents had they been allowed to get into the game…..PS…Three wins on the bounce. Final analysis…this report was written a week late, it turns out that Bharat Parivar hit 275 to tie a high scoring game the following week against a strong Sportsman CC side, which included the destructive Kris Ali and Vijay Chandramani. So maybe this was a pretty decent performance from the Elf lads. Samaritans update….Chris Hall, Ian Chuck and Alex Nunns could all be seen glued to their phones in a darkened corner of the changing room after the game. Too close to call who spat their dummy out the furthest today, but it was roughly the same distance that Alex Nunns kicked his glove after getting out. Tea update….Victoria Sponge from Aldridge is sorely missed. A good supply of Farleys Rusks for the Pharivar Number 11 though. 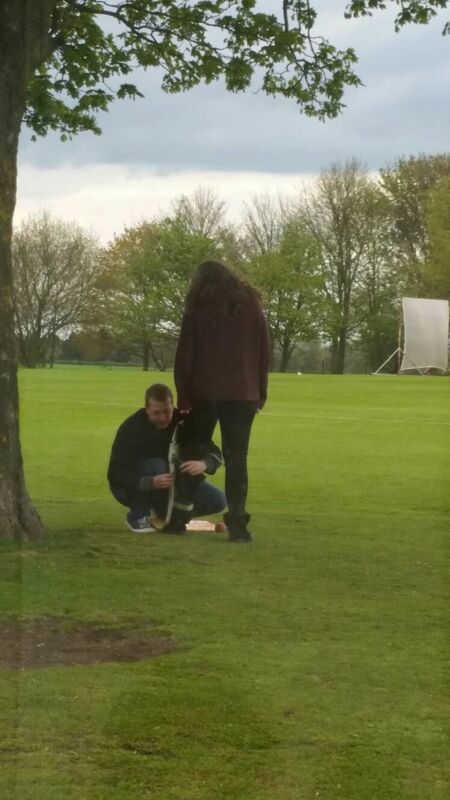 Village moment of the day….Dan Dunn, seen strolling round the boundary, with his 3rd bottle of Becks, despite his History exam being less than 24 hours away. Too which Greg Philpott commented, lets hope question B is all about Prohibition…..Brilliant. The Elf made their second consecutive away trip this week down to always good hosts at Lapworth in rural Solihull. The sun was well and truly out and in the absence of Rob Hewlitt, Ian Chuck hastily went out to the middle and became Nasser Hussain reincarnated when he WON the toss and decided to BOWL first on a glorious day. Tom Davies and Chris Hall’s faces were of sheer disbelief (the result will tell you that Chuckie was right but hey-ho). Dan Armstrong and Dave Stephens opened the bowling for the Elf and looked to be toiling away to no avail until Dave trapped Marsden lbw for 1 in his third over. Some real tight bowling from the Elf pair saw Armstrong dismiss the other Lapworth opener Lewis for four runs. The scoreboard didn’t get any better for the hosts as Stephens bowled Agnew for five and the side from Warwickshire’s backs were to the ropes. Tom Davies replaced Armstrong in the 11th over and with his first ball served up a pie that monsuiers Blumenthal and Ramsey would have been proud of. The Lapworth batsman couldn’t believe his eyes when such a beef & merlot pie was headed his way but he hit the shot straight to Greg Phillpott in the covers and the Elf were coasting. In his seventh over, Stephens picked up Williams and Lapworth were in disarray at 30-5. The home side then had a massive dig in from Carr and Buckle who put on an excellent 50 run partnership to steady the ship but ever reliable Ian Chuck got Buckle for a well played 16 and the Elf were looking to wrap things up. However, Gallacher had different ideas and hit a quick time 17 including a big six over cow corner into a tree. Dan Armstrong finally picked up the 7th wicket of the innings and should have had the eighth when Carr who was on 45 at the time nicked off to Gort but the umpire said not out. The incident clearly played on Carr’s mind as he couldn’t get the ball off the square and in JP’s first over hit a sweep straight to Tom Davies on the 45 degree and he was out. JP got Faber for two caught by Rich Fell who was sporting a suspected dislocated thumb but the Elf could not get the final wicket and Lapworth posted 124 for victory. In the late afternoon sunshine, Gort and Chuck got the Elf’s innings going. In tricky batting conditions the usual opening pair looked undeterred until Chuck nicked off to Smith and the Elf were 39-1. Alex Nunns on the back of his superb 30 not out last week did the same as Chuck and the Elf were 51-2 approaching drinks. 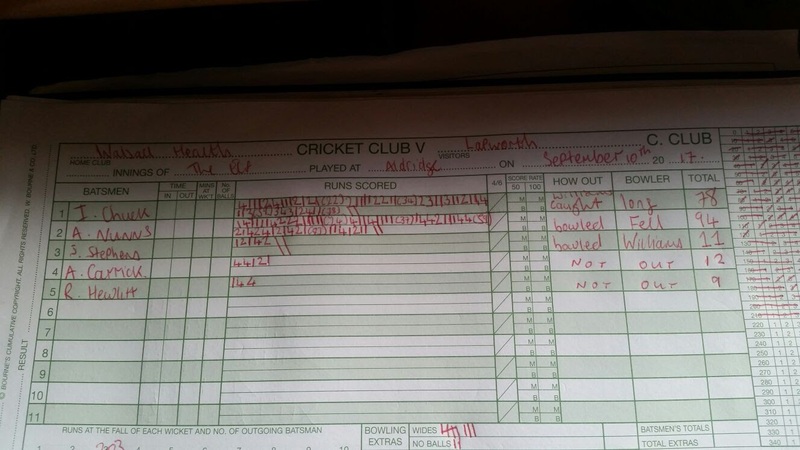 Captain Rob Hewlitt decided to take matters into his own hands and smashed a boundary laden 24 to give the visitor’s innings the impetus it needed. Rob departed on 86-3 when he was bowled by Buckle. Greg Phillpott joined Gort and the two men saw the Elf past 100 and almost into cruise control territory you’d think? However, despite Rach and Tom balling at JP to lift his leg in the air with the score on 111 he did not and Gort spooned a catch to mid wicket, the away side still 13 runs from home. Greg Phillpott looking comfortable on 14 then got caught off the impressive looking Choudry and Lapworth smelt blood. Dan Armstrong had a brain meltdown (probably still pissed from turning 18 on Thursday) was caught behind and two balls later Chris Hall notched his second quack of the season and the Elf looked to be snatching victory from the jaws of defeat. Step up Ben Stokes wannabe Tom Davies, with wickets tumbling around him the Elf bowler smashed ‘Carr’ for four through square leg with his first shot and then with his third played the most exquisite cover drive you will ever see. The Lapworth fielders just watched as the ball raced to the boundary and all of a sudden the scores were level and with the second ball of the next over Dave Stephens scampered a single and the Elf were home for their second victory of the season. Exceptional tea as ever at Lapworth. Variety of sandwiches, pizzas, pork pie, cakes, tea and even some fruit at the end to give it a solid 8.5/10 (no olives, no 10). 7 for a shower this evening and the showers at Lapworth even came with their own curtain so the Elves aching bodies were not on display. Decent spray and temprature 6/10. No rowing feats this week however with Chally coming off ‘non fer’ I feel for the concept twos in Tipton Sports Academy Monday evening…. The Elf made their usual springtime journey down to the village of Peopleton to play away for the first time in the 2018 campaign. The Elf were fielding first on a warmish day in the countryside with Dan Armstrong and makeshift opener Tom Davies opening up proceedings for the Elf. Tom had a couple of catches go down but it wasn’t until Elf icon Chris Hall replaced Armstrong at the ‘cow end’ that the Elf were on the board. JP watching his bowling being dispatched over the fence. 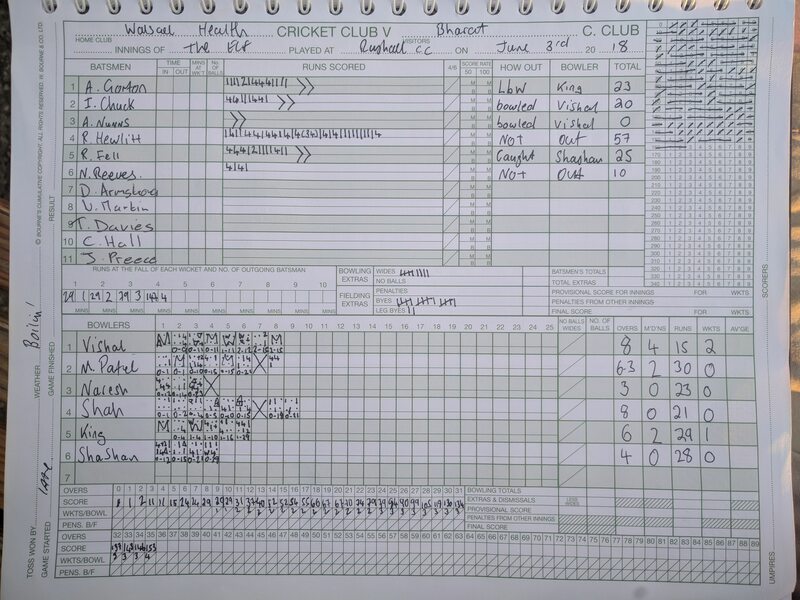 Dan Armstrong got Deeprose for 30 when Greg Phillpott (or Phil Pot as he was in the oppo’s book…brother of Pol) and the Elf reigned the hosts back in with some tight bowling. Greg came on and took two wickets in his two overs to boost his bowling average with Alex Nunns taking an excellent catch at long off to get Greg his second wicket. With the game evenly poised Rob inserted Tom Davies back into the game and Davies produced a jaffa to get Peopleton skipper Smith out for an excellent 28 which included a couple of lusty blows into the cow field. In his next over Davies got two wickets in two balls but didn’t manage to deliver on the hat trick ball. Trig and Chall kept things tight until the end but Peopleton would have been disappointed to set 200 for victory after being 128-1 in the 25th over. After Tea and picnics were demolished (see tea/picnic review) the Elf looked to chase down the 200 run target for victory. Two youngsters opened up for Peopleton who kept things relatively tight and the Elf were 48-0 after 10 overs with very few chances to speak of. Gort was going along nicely and Chuck was looking to get some big runs on the board after failing in his first hit of the season. The boys brought up the 100 partnership in the 19th over and the outfield was very quiet until Smith steamed in and trapped Gort LBW for 49. The Elf legend will be disappointed to have not raised his bat today as he batted well very well in tricky conditions to see the Elf to a wonderful start. Alex Nunns came in at three and needed a score after he average of 0.5 so far this season was not giving the man from Wednesbury the confidence with the bat. Al and Chuck saw the visitors past 150 but Chuck having not given a chance all game, spooned a tame shot up to cover when he was on 99 to get out one short of a deserved ton. The Elf nerves were jangling when Nath Reeves was out for a duck and skipper Hewlitt out for 5 but with Al providing good resistance at the other end he looked comfortable to lead the Elf home. Greg Phillpott did just that after hitting two boundaries in his 10 not out to see the Elf to victory with 15 balls remaining. Alex Nunns also finished with 30 not out including a six over fine leg to give him some much needed confidence with the willow. First win of the season boys! Get in there! The lads travel to Lapworth next week to hopefully get their win/loss record at even par going into the second May Bank Holiday. Much better teas at Peopleton this year, with some wonderful cheese sandwiches and Swiss Roll to boot. HOWEVER. Gail was on chief picnic duties in the sunshine and delivered a spread of champions. Three words – Olives, strawberries, mustard. Eat your heart out Aldridge. Lizzie (Mrs Chuck) who was also on chief photograph duties, provided two superb key lime pies that athletes Rich Fell and Chally tucked into several times (see pic) and also some homemade sausage rolls which I believe did not get the credit they deserved, sensational. 11/10 picnic. Decent showers today but only two of the three could be on before the pressure subsided. Chuck found some ‘Ginger anti-dandruff’ shampoo which Al and Tom denied any knowledge of. This was after Al did his best Torvil and Dean impression on the way for a shower. With Dan Armstrong turning 18 in the week, the boys are already discussing what shower gel he is going to bring on debut next weekend in Lapworth. Tom smashed through the 500m barrier in the gym this week posted 1.35.2 to leave Chall metaphorically eating his dust. The Elf ironman declined to comment on such an achievement accept from saying ‘I need to work harder’. Second game and same story for the Elf this season, a loss. On the coldest day for cricket in the history of the game the Aldridge skipper won the toss and decided to bat first. The teenage Dans opened up for the Elf and ‘Older Dan’ Armstrong struck the first blow getting Arblaster for 2. Armstrong also got Wilkinson with a catch of the season contender from Iron Man Chris Hall…think Ben Stokes off Stuart Broad in the 2015 Ashes, it was that good. A strong partnership between Handsaker and Davies for Aldridge saw the Elf lose a bit of momentum and it wasn’t until Tom Davies got Aldridge’s Davies out for 34 (after he’d had a strop). Chris Hall had toiled away up the ‘mini travelator’ all afternoon and was finally rewarded with a wicket in his last over when Superman Gort caught a slight nick off Chall’s bowling. After a couple of drops and few hefty blows, Aldridge’s captain was finally out for 42 off Greg’s leg spinners. The Elf had Aldridge 112-6 when Greg joined the circus and juggled a catch which he finally caught on the third attempt and the Elf were still in the game. Rogers was suspiciously given not out when he was stood like a flamingo on one leg, he went on to make 36 which was probably the difference between the two sides. Leo Chuck was fresh from his time serving Queen & Country and bowled with some needed pace picking up Milne and Arblaster in the same over to get his first wickets for the Elf. 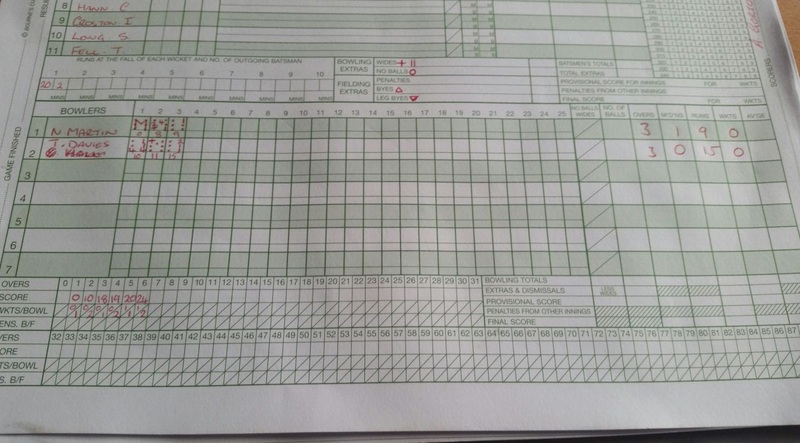 JP was summoned and did what he does best – take wickets. JP picked up the dangerous Rogers and Ali in his third over to leave the Elf needing a tough 186 for victory. The Elf had to bat 10 overs before tea was prepared so the game had a bit of a test match feel to it where the openers were trying to ‘survive until tea’. In the tenth over Gort was triggered by Greg and the Elf piled in for tea at 22-2 . 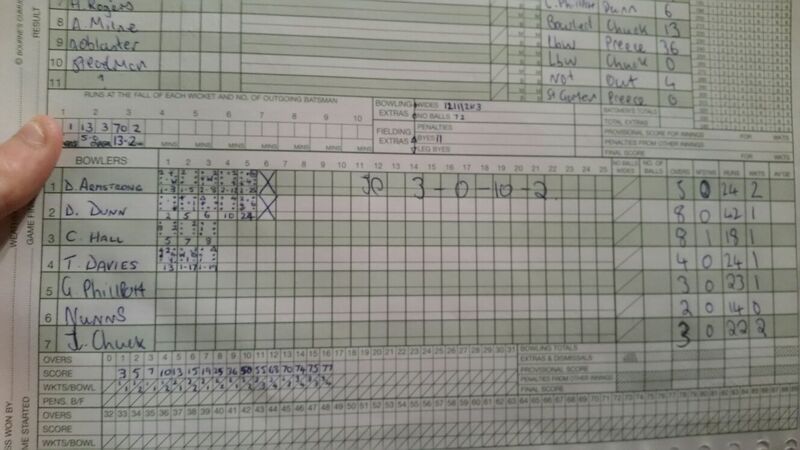 Nath Reeves came in and batted well until he was bowled for 4 (still a better average than Chuck). Dan Armstrong batted at three and did some excellent crease occupation for 15 overs but scored as quick as his over rate and only managed 5 before he was triggered. 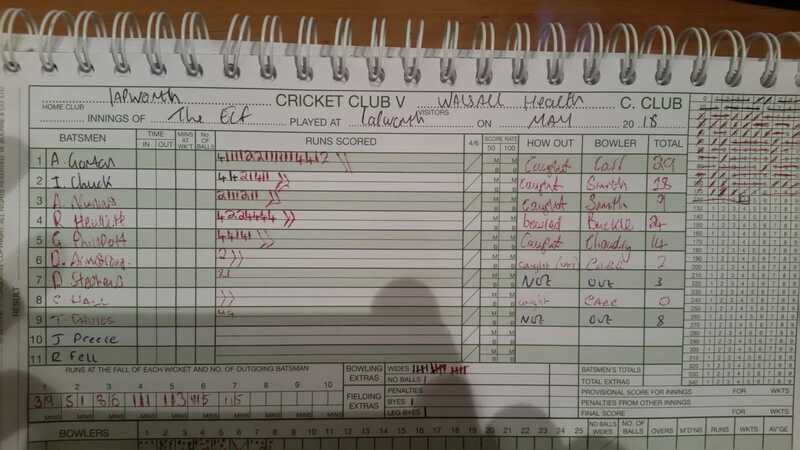 Leo Chuck scored the first duck of the innings and the Elf were floundering at 50-5 but a good partnership between skipper Hewlitt and Elf heart throb and chief showerer Greg Phillpott put a bit of respectability on the score, when Greg departed for 16 the Elf were 101-6. Good #digin fellas. However, as good as the 6th wicket partnership was, the next four wickets fell for seven runs and the game was over. Firstly Rob Hewlitt was triggered by Leo for an excellent 41 a real captain’s knock from Rob today to defy the opposition a massive victory. Chris Hall was out and then Tom Davies nicked off, the ball flicked the keeper’s pad, ballooned in the air and first slip took a superb diving one handed catch. Then team hat trick was complete when Dan Dunn chipped Yacob back to himself and the Elf slumped to a 77 run loss. Not a great start to the season but the solidarity in the boys will see us through, let’s keep going a push for that first victory! Tom beat Chall’s 500m time this week to set the record at 1.36.0 but Chall posted the best 200m time at 36.9. All times and challenges on the first match report. Resident and regular player Ian Chuck has suspiciously only played 50% of games now there is a lady on the scene. Today he took her to mini golf instead of playing. Just let that sink in….MINI GOLF instead of playing. Colder than a lot of my ex-girlfriends. In other words – practically Siberian. The Elf played their first fixture of the season, a direct replica of last season’s opener except they were on the losing side this time. Rob Hewlitt won the toss and gave the ‘soft signal’ from the square, which was about 150 yards around from the pavilion which left Dai scrambling for his binoculars. ‘Ian’ Chuck (as he is now known) and Andy Gorton opened the batting for the Elf and in true Billy Ocean fashion the going was tough in the first 10 overs , the hosts barely scraping past 2 an over. The first change brought about two quick wickets for the visitors when Adrish got one to nip back through the gate and ‘Ian’ was out for 2. Alex Nunns was in at three but was immediately triggered by Dave Stephens for the first Elf quack of the season. Token Yorkshire man Andy Carrick was in at 4 and a steady partnership with anchorman Gort saw the Elf creep their way towards 50 before Andy chipped a cut shot straight to point for 12 hard fought runs. 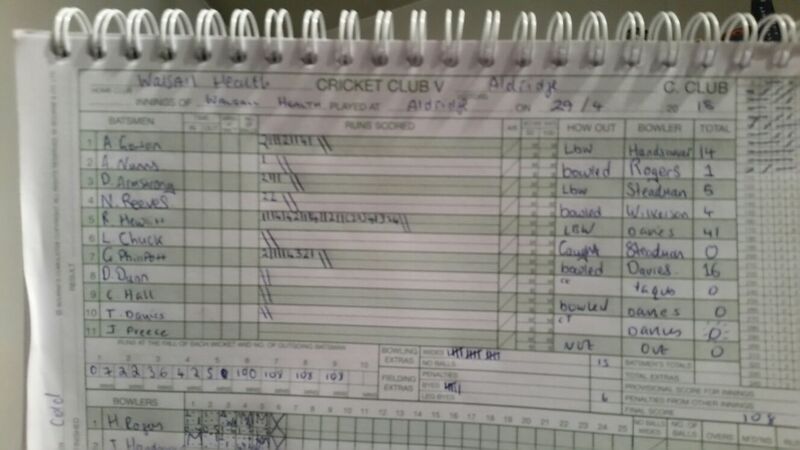 Skipper Hewlitt hit three boundaries on his way to 13 to give Abeer his first scalp of many for the day. Rich Fell then came in and dropped a second anchor alongside Gort who was now gradually eking his way towards a first 50 of the season. 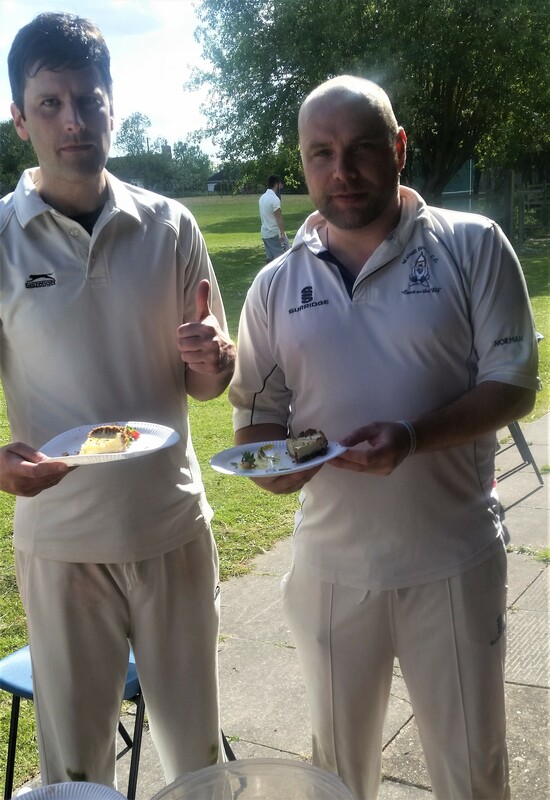 Two Elf veterans who have over 50 seasons of experience between them certainly put that on display and a fine 55 run partnership saw Gort get his first 50 of the season before being caught off the bowling of Williams and Greg Phillpott following shortly after scoring the same amount of runs as Al. Rich dealt in singles for his innings of 10 and Dave Stephens joined him for a short cameo of 16 laden in boundaries before both men were out in the last few overs of the game going for runs with the Elf in and around the 130 mark, about 40 runs short of a decent total. Chris Hall, Tom Davies and Jonny Preece or as Chally himself described them ‘nine, ten, jack’ scrambled six runs between them including a fine cover drive from Tom Davies for his first boundary of the season. A six for including four wickets in four balls for Abeer was mainly the difference between the sides today with the ball. The Elf posted a meagre 140 in the last over and with one boundary only 35 paces from the wicket it would take some good bowling to limit an always strong Sportsman side to below that. After tea was demolished The Elf went out to defend their total, Zinger bails in tow. After some really tight bowling in the first 7 overs – which coincidentally went by quicker than Dan Armstrong bowls one over, the wheels came off a little bit. 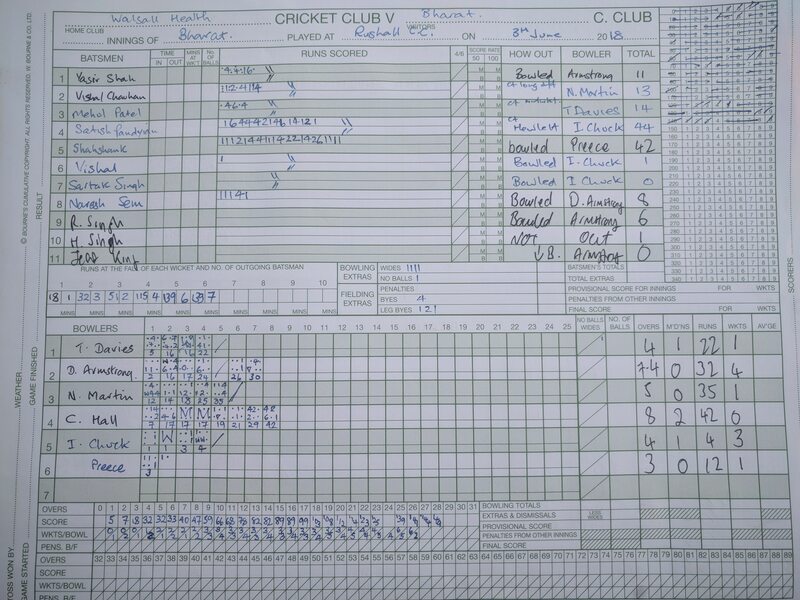 ‘Ian’ Chuck and Dave Stephens had more or less kept Sportsman to a run an over but Dave suffered some real tap by going for 39 in two overs, including 6 sixes in 12 balls from Sportsman slogger ‘Waqas’ who found the very short boundary to his and his bat’s edge’s liking. in the ninth over of the game play was significantly delayed when Andy Carrick who bravely dived to cut off some runs fell awkwardly and appeared to have dislocated his shoulder. Good news on that front, after the delay and later update Andy is recovering fine however some of the day’s finest moments came in amongst the delay. Firstly Dan Armstrong went and waited on the main road with a pint in his hand for the Ambulance crew who came and really took care of Mr Carrick (lots of love for the NHS here) but also a hilarious moment when one of the female paramedics asked Andy ‘if it was okay if she touched it’ which left Tom and Greg scrambling for a suitable innuendo. Armstrong also was left in charge of the medical kit (see photo, and also see the tight grip on the pint) before Andy was treated. In all seriousness, everyone at the Elf wishes Andy a speedy recovery and hope he will be back in time for the weekly Love Island Updates when ITV’s show returns in the summer. Chris Hall and Tom Davies came on in the 11th and 12th overs after the score was revised by 10 overs and 30 runs as the light was fading due the delay which couldn’t be helped. Chally who claimed he hadn’t bowled since September picked up where he left off, taking wickets. A catch in the deep from 2017 fielder of the year Greg Phillipott saw the back of Waqas who hit 54 out of the 62 Sportsman had posted at this point including 7 sixes. Hall quickly dispatched Hembo back to the hutch after Gort snaffled a catch standing up to Chally. 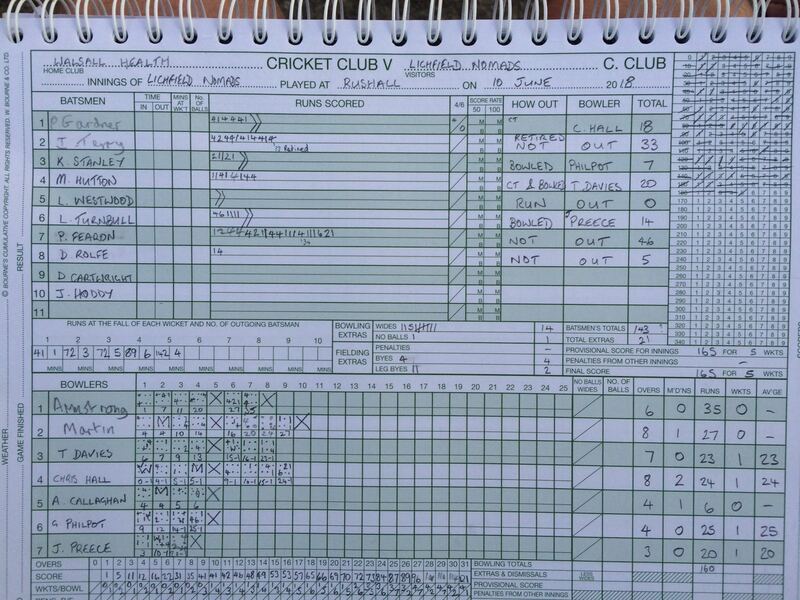 Sportsman’s skipper Walder and Maz scored a few runs before Gort was razor sharp once again and got him stumped. Tom Davies toiled away for 5 overs and only went for an economical 6 runs but no real chances of note. 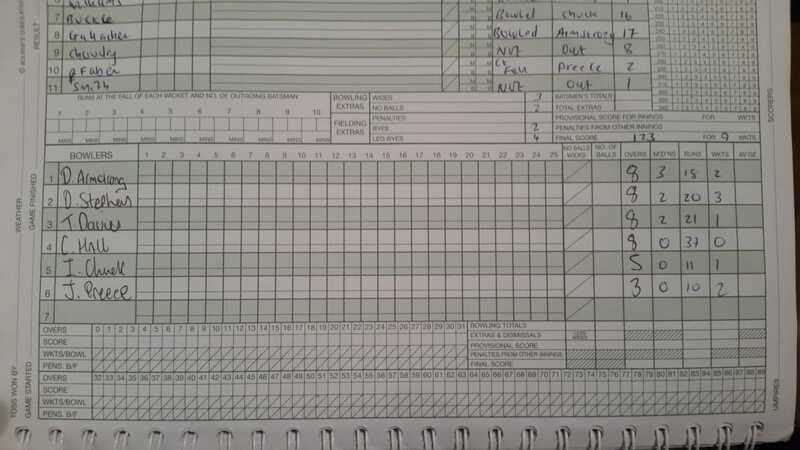 Jonny Preece replaced Davies and picked up a wicket off his first ball when Walder’s eyes lit up off a J.Preece beef and merlot pie, Walder swung everything at it and got his bails knocked back and JP was off the mark for the season. Experienced Sportsman batsman Calvin Williams came in and steered his side home with 3 and a half overs to go without much trouble. An array of wonderful smells emanating coming from the home dressing room this week. However Greg’s ‘Cherry Bakewell’ and Al’s ‘Foamy Banana’ win best shower gel this week. Imperial Leather certainly coming up trumps this week. A slight complaint is that the showers at Aldridge really have slow water flow, the lads are praying for some away games soon so they can take advantage of some good showers. Challenge 1 – simply 500m in the quickest time you can. Resistance on level 8 on a concept 2 machine. Chally has the current record of 1.36.6 but Tom is only half a second behind on 1.37.1. Challenge 2- row 200m in under 40 seconds with only a minute break in between. Chall has managed 7 successful 200ms and Tom has reached 6. This challenge is A LOT tougher than it seems. Challenge 3 – 1000m as quick as you can. This is really the big fish. Tom has set 3.31.4 and Chally is floundering behind around the 3.37 mark. On a day that records could have been set and landmarks achieved with both willow and leather in an already record breaking season, it was down to two things: the toss of the coin and skies above. Fortunately skipper Rob Hewlitt won the toss and Chuck opened up with Al. 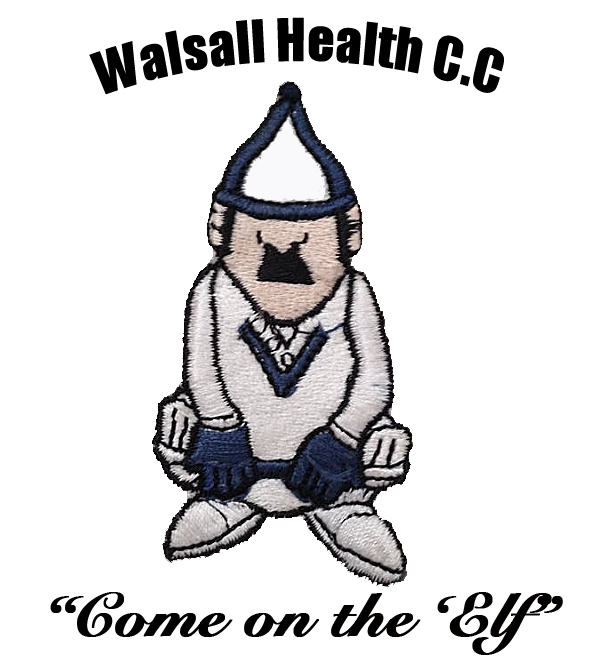 Chuck was 55 runs short of reaching 1,000 runs in a season, a feat that has never been seen before in 30 years of the Elf. Al and Chuck were going along nicely but both men gave chances early with the Lapworth fielders looking like they couldn’t have caught a bus, let alone a cricket ball in the opening exchanges. The wind chill factor was certainly affecting the players and spectators but the opening partnership went nicely past fifty and Nath Martin (who had ‘done a lap’ with Chorley and Dan ‘two plates’ Armstrong) called Tom Davies from the other side of the field who was scoring to ask what Chuck was on, 27 was the reply and the Elf lads watched on nervously for a few more overs. At drinks break the Elf were 80odd for no wicket, Chuck chugging along nicely on 39 and Al surpassing him slowly to hit another well made fifty just as the Elf went past 100. Chuck seemed to take an age to get into the forties but when he did, there were muted celebrations when Chuck hit a single to reach fifty, the whole squad knowing he was five away from greatness. With the very next ball he faced he slapped a four through the covers and it took him two more deliveries to get that elusive single where Chuck ran through, arms aloft screaming ‘yes’. Quite village really, think Kevin Pietersen vs. Australia in that 5th Oval test in 2005. What an achievement by Chuck, surely going down in Elf folklore for an astonishing achievement. At this point, Chorley eventually could sit down as he’d spent the first half of the game pacing around the boundary in anticipation of the record. Chuck and Al put the Lapworth boys to the sword in the overs that followed, boundaries galore in a 173 run stand putting that partnership 3rd on the Elf all time list. Good biffing lads. Chuck eventually out for 78, 23 runs over what was required in what’s been a top season with the wood in his hands. Sam Stephens entered the fray with only required 9 to reach 2,000 runs for the club and Sam brought it up in typical Sam fashion – a boundary. Unfortunately it didn’t last long and he was out for 11 but again what did he care? A landmark was achieved. Andy Carrick hit a couple of boundaries on his way to 12 not out but the one thing the Elf wanted to see was Alex Nunns reach his ton but it was not to be, eventually bowled for 94 but still another record set, this was Al’s highest score for the Elf. 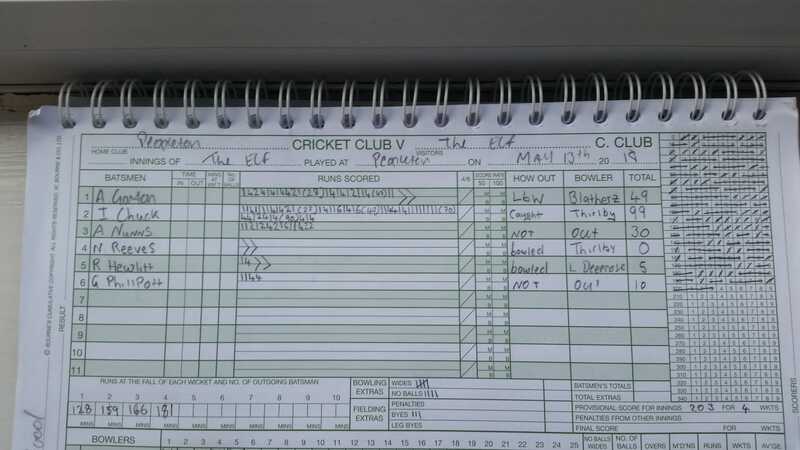 As the rain set in, the Elf finished on 218-3 after 38 overs and the two skippers decided on a 38 over game after tea. With the ‘bowling award’ in sight, Rob Hewlitt asked Nath Martin and Tom Davies to open up in a shoot out for the award. Nath started in great fashion with a maiden and Tom bowled typically crap when he was biffed for two fours in first over just as the rain set in. In Nath’s third over the batsmen went for a quick single and Andy Carrick produced some excellent fielding at cover and a precise throw to Trig behind the stumps to put the Elf ahead on Duckworth/Lewis. It was not to be as at the end of Davies’ third over the rain set in again and after 20 minutes or so of heavy rain both skippers shook hands and the game was abandoned. What a season it’s been for the Elf, a record setting fourteen wins and records set with the bat with Chuck and then Chris Hall and Tom Davies becoming the first bowling pair since 1993 to both reach over 25 wickets for the season. More of the same next year please. A final shout out to those at the club who might not play but certainly have a massive impact, Both Rach and Gail for organising and preparing EPIC teas when the fixtures are at Rushall. Dai for his continued support throughout the season and Chorley for keeping all stats up to date. Also to Rob for excellent captaincy and even organising as the season goes on and also to everyone else who turns up and makes Sundays such a joy with the loom of work the next day. Let’s make 2018 better and 2017! The showers at Aldridge have gone down recently, low pressure and a spray of water. The bright spot being Elf heartthrob Greg Phillpott having three showers just to find the correct pressure after some PPP the night before. No travelator on the top pitch but Martin & Davies had to deal with bowling into rain and bowling with a ball that resembled a bar of Cussons’ Pearl soap and having to run in through what could have resembled the field in Passchendaele in 1942 to bowl their overs, muddy to say the least. The lads were glad it was over when the skippers called it off. Well done lads once again, great season and I’m glad these reports are received so greatly by all those who read them. Many thanks and see you in 2018.